First, thank you for your book suggestions. Last night was my turn to host and it was Book Club #18! EIGHT-TEEN. That, my friends, is dedication. 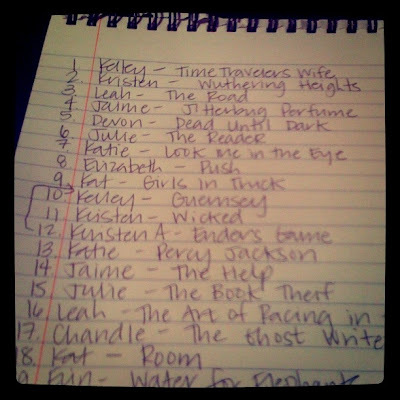 We decided to make a list of books and their selectors. I love how similar our book clubs' lists are. Even though I have a lit degree (or perhaps especially because I have a lit degree...) I hated the idea of a book club. But now I lurve mine dearly. Recommendations from me to you. Historical fiction: Ken Follet's Pillars of the Earth or Fall of Giants. Diana Gabaldon's Outlander series. One Thousand White Women: The Journals of May Dodd. My Enemy's Cradle. American Wife. Fiction: The Hunger Games trilogy (it's young adult, but it's a MUST READ). And I too enjoyed all of the Uglies books (more young adult...what does this say about me??). The Thirteenth Tale (another must) also The Forgotten Garden by the same author (not a must, but good). Nonfiction: Nuture Shock. Better Off: Flipping the Switch on Technology. Old School: Agatha Christie's And Then There Were None. DeMaurier's Rebecca. Anything Austen or Bronte. Sorry about the mammoth list. I love my book club. We started 9 yrs ago when I was pg with my middle kiddo and still going strong. We've changed a few members over the years but I think my bookclub friends are some of the best ones I have now! Hey you should join our virtual bookclub too, I'll send you the link! I have our bookclub selections listed on goodreads.com. Wuthering Heights is my fave!! The movie is good, too.